Paperback, 9.75 x 9.75 in. / 260 pgs / 170 color. Text by Michael Corris, Jennifer Doyle, Cliff Lauson, Ali Smith, Ralph Rugoff. 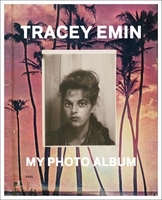 Since she first emerged in the early 1990s as a member of a generation later tagged “the Young British Artists,” Tracey Emin (born 1963) has made art that takes as its starting point the most harrowing and intimate details of her personal history. 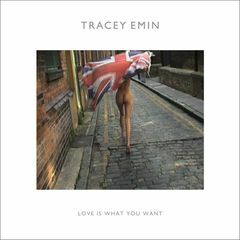 Published for a major exhibition at the Hayward Gallery in London, Tracey Emin: Love Is What You Want brings together suites of works from across the artist's career, spotlighting her achievements in a wide variety of media, including sculpture, drawing, painting, text-based works, photographs, video and performance. Sometimes confrontational or sexually provocative, Emin's art resonates with the “personal is political” legacy of feminist art, while simultaneously speaking to relationships in general, as well as exploring spirituality, cultural identity, class and celebrity. Disarmingly frank and often deeply confessional, Emin's art is also animated by her playful and ironic wit, as this new survey monograph indicates. 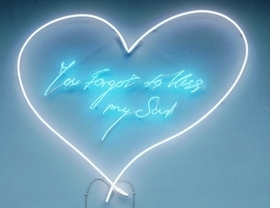 Featured image, Tracey Emin's You Forgot to Kiss My Soul, 2001, is reproduced from Love is What You Want. "From the beginning, her art has intently explored emotional subjects, including love and desire as well as the breaking of faith and trust. Concerns about belonging and displacement, nationality and bigotry, have also served as jumping off points for works that have found new forms for intimately addressing feelings and thoughts that many people prefer to hold at arm's length. Alternately tough, sentimental, desperate, angry, funny, and full of longing, Emin's art makes use of an expansive range of voices and tones, while mining her own personal biography for much of its raw material. Consequently, it is easy to feel that we know her already." Ralph Rugoff, excerpted from the foreword to Love is What You Want. Foreword by Jill Snyder. Text by Margo A. Crutchfield, Barbara London, Linda Nochlin. Edited by Tracey Emin, Damon Murray, Stephen Sorrell. 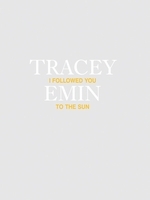 Introduction by Tracey Emin. FORMAT: Pbk, 9.75 x 9.75 in. / 260 pgs / 170 color.